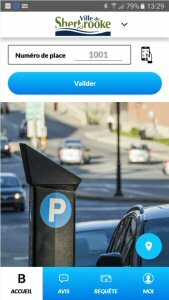 • Today, the City of Sherbrooke launched the new generation B-CITI parking application which revolutionizes parking transactions by offering refunds for unused time, prepaid time credits, visual recognition and multi-city capabilities. • B-CITI is a smart city portal developed by the Canadian tech startup B-CITI, in partnership with the City of Brossard and the École de Technologie Supérieure (ÉTS) in Montreal. • Within 6 months, the B-CITI smart city portal has allowed the City of Brossard to reduce consultations at City Hall during intense registration periods by 95%, while 65% of resident cardholders have obtained a digital resident card. • B-CITI is led by Vivianne Gravel, the founder of LIPSO (2000-2010), a developer of several well-known digital technologies including mobile parking payments for Stationnement de Montréal (Montreal Parking) and Air Canada's mobile boarding pass. 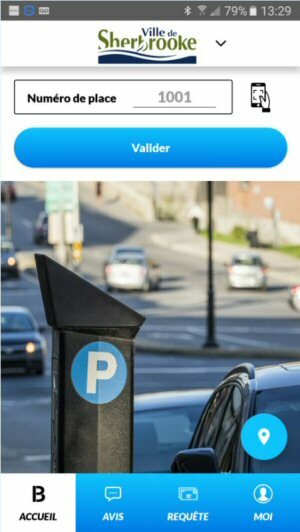 Today, the City of Sherbrooke launched B-CITI's new generation multi-city parking application, which offers a number of cutting-edge features including refunds for unused parking time, prepaid time credits that reduce transaction costs, and visual recognition of parking places. In addition, the multi-city application allows residents of Brossard, for example, who have registered with B-CITI, to access the application when in Sherbrooke. B-CITI is a smart city portal that marks the passage of cities into the era of smart cities, Big Data and artificial intelligence. Launched by B-CITI in partnership with the City of Brossard and the École de Technologie Supérieure, the B-CITI smart city portal addresses the challenges of traffic congestion, security, economic development and environmental protection, in a context where 50% of the world's population currently lives in cities. Following Brossard (deployed in February 2016), a number of other cities will deploy the B-CITI portal in 2017. The idea for the portal came about when reflecting on ways to improve the services offered to residents of the City of Brossard. Realizing that no such thing existed on the market, B-CITI, a Canadian start-up specialized in digital technologies, developed the smart city portal. "All cities aspire to become true smart cities. At B-CITI, we've developed, along with our partners, the world's first smart city portal. The portal offers cities and their residents the possibility to stay connected and make enormous gains in efficiency," explains Vivianne Gravel, president and CEO of B-CITI. "Brossard is among the most innovative cities in Quebec and Canada with regard to smart cities. The B-CITI smart city portal, with its digital resident card that we were the first to adopt, puts us at the cutting edge of smart digital interaction with residents," states Paul Leduc, the mayor of Brossard. The basic B-CITI smart city portal, customized according to each city's needs, combines digital resident cards, renewals and payments of subscriptions and activity registrations, reports to the city with or without photo attachments, news, emergency alerts, online appointment scheduling and instant surveys. Additional digital modules are available to B-CITI clients, including residents consultations, parking permit management, a smart personal assistant that instantaneously answers oral and typed questions, a digital card reader allowing cities and their partners to make accessing services easy from anywhere, the parking application with visual recognition of license plates and an e-waste disposal directory to geolocate the nearest drop-off point according to the type of waste. Other smart services will be made available in 2017. The development of the B-CITI smart city portal will be powering smarter cities. Based out of the INGO Innovation Centre at ÉTS, in the heart of Montreal's Quartier de l'Innovation - the city's innovation centre - B-CITI has been working with researchers from the Communications and Microelectronic Integration Laboratory (LACIME) at ÉTS as research partners. In addition to its early collaboration with ÉTS, Mitacs and the Natural Sciences and Engineering Research Council (NSERC), B-CITI recently established research agreements with the Institute for Data Valorization, a scientific and economic data science hub (IVADO-HEC/École Polytechnique de Montréal/Université de Montréal) and the National Research Council of Canada (NRC), bringing together numerous internationally renowned experts in Big Data, security and artificial intelligence. B-CITI, designed to be evolutionary, connects systems, centralizes data and city processes and develops data validation and learning algorithms, as well as decision-making support techniques. Founded in 2015, B-CITI is a Canadian tech startup specialized in digital technologies. The B-CITI smart city portal was developed by B-CITI in partnership with the City of Brossard and the École de Technologie Supérieure (ÉTS), and an additional research partnership was recently signed with IVADO. The company has a total of 25 employees. The B-CITI smart city portal is deployed in the city of Brossard and will be deployed in 2017 in a number of other cities including Beloeil, Blainville, Longueuil, Saint-Basile-le-Grand, Saint-Constant and Sherbrooke. In November 2016, B-CITI was selected as a finalist in the Ericsson "QI Connexion" Smart City Challenge. Visit www.b-citi.com for more information.